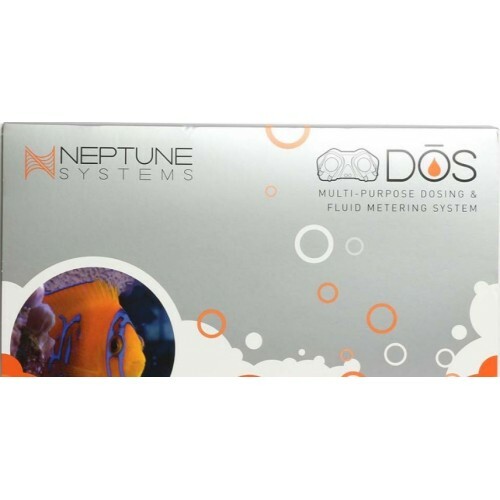 The main reason people purchase a dosing system for their aquariums is for consistent and easy dosing of 2-part solutions (calcium and alkalinity) to their reef tanks. The most common method for doing this today is to use standalone dosing pumps and run them on a timer using seconds or minutes to determine how much to dose. This is not only confusing, but also prone to inaccuracy. Everyone knows that when measuring a fluid it is done by volume, not time. Every dosing calculators out there uses volume. So, with the DOS (and the Apex Fusion interface) you simply enter the amount you want of each part of the additives (one on each pump) and what hours of the day you want it delivered. The DOS then sets up all the dosing intervals within that time period. When that time interval is finished, the exact volume you set has been delivered. It even automatically chooses the slowest speed necessary for the pump so that it minimizes noise. Simplified 2-part dosing - The DOS wizards in Apex Fusion take 2-part dosing to the next level by integrating a feedback loop from your water testing to make suggestions to fine tune the amount you dose each day. Simply put in your tank size and after a few days of entering testing results, it will help you refine your dosing amounts for the demand of your particular aquarium. Automated water changes - Water changes with the DOS are super easy. All you do is place your empty vessel and your fresh stock of saltwater under your stand. Then, with the Apex Fusion wizard just tell it an amount of water you want to change over what length of time and the hours of the day you want it to happen and it figures it all out for you. It will perform an automatic, continuous water change for you. It gets better. If you have our dual optical water sensing accessory Apex Fusion will send you an email or text message letting you know it is time to change out the jugs. Less time pumping, siphoning, and sloshing water and more time for enjoyment. Dosing micro amounts - If you need to dose tiny amounts of a particular solution, element or other fluid (like vodka dosing or Zeovit systems), the DOS is the perfect solution due to its precision controlled stepper motor. Large diameter tubing - Larger size tubing means that your pump does not have to work nearly as hard – or stay on for longer cycles. The most popular dosing pumps on the market use tube fittings with the tiny diameter of 1.67mm. 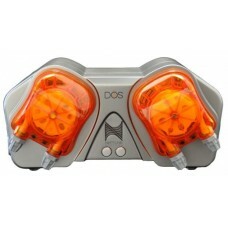 The DOS uses much larger tubing and fittings. In fact, at 3.33mm in diameter, the pump on the DOS can handle 4x the flow of the most common pump. Adaptability - The DOS has an accessory port that will enable it to be connected to an upcoming optional accessory like the yet-to-be released DDR – Dual DOS Reservoir. Exceptionally silent operation - The Neptune Systems engineering team has taken great steps both in how the pump operates as well as the enclosure design to ensure that the DOS system is one of the quietest dosing systems on the market for the fluid volumes it delivers. The DOS pump includes two pump heads for the most popular of two part dosing, but it is not limited to just two part dosing. You can use it for automatic water changes once a week or even once a day, minor trace element additive dosing, liquid food dosing, or pretty much any other liquid your tank may need dosed in measured amounts. 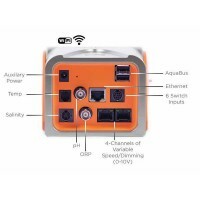 You simply just connect the DOS Fluid Metering system to your Apex controller with the included AquaHub cable and with the Fusion cloud software programming a dosing pump has never been so easy. The DOS system when interfaced through fusion can be programmed to dose a certain amount of liquid between certain times of the day. 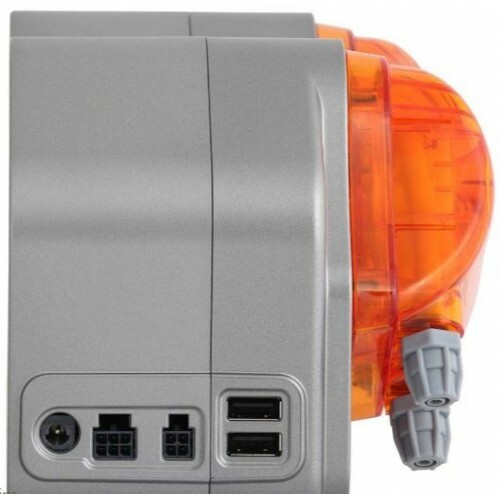 The DOS pump is so intelligent it will even change the speed of the motor depending on the amount needed to be delivered to the aquarium to keep noise at a minimum.